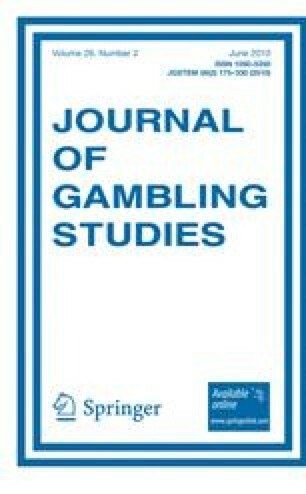 Slot machines are the most “addictive” games because (a) the disorder (pathological gambling) appears more rapidly in these games than with any other; (b) most patients who seek professional help are mainly addicted to electronic gambling, and (c) even though it is not the more frequent game, most of all the money spent on legal games of chance (at least in Spain) goes to slot machines. Structural characteristics of slot machines induce to gamble because electronic games show the main parameters of operant conditioning, mainly the immediacy of the reinforcement. Ten pathological gamblers played slot machine in two conditions: immediate and delayed reinforcement. The results corroborate the importance of the immediacy of the reinforcement in gambling, because when the result appears immediately (after 2 s), more games are played than when the result is delayed only 10 s. Critical issues in problem gambling prevention and public health are discussed. Parke, J., & Griffiths, M. (2002, February). Slot machine gamblers—Why are they so hard to study? Electronical Journal of Gambling Issues: eGambling, 6. Retrieved June 24, 2005 from http://www.camh.net/egambling/issue6/index.html. SDI, Spanish Department of Interior (2009, April). Informe de Juego 2008. Retrieved May 17, 2009 from http://www.mir.es/sgacavt/juegosyespec/juego/.